and now we have the invisible hand that pulls all the triggers: Ghost writing in Medical Journals . Unfortunately this last piece of research has not been peer-reviewed or published yet, but prior work by the same authors has shown worrisome rates of ghost authorship previously. When I think about the drugs I use for my patients, the journals and lectures I rely on for my ongoing education, I am becoming more and more troubled. If the drug companies fund the studies, write the papers, market the drugs, provide my education surrounding them, and fund the guidelines I use to guide my decisions, how can I avoid giving my patients drugs that do them harm? This is why we have government, when markets fail to self-regulate, when they are too opaque for any one human to suss out the truth, this is where the government should step in. And yet, even here we see failure. I remember learning about the Clinical Trials registry in an ethics class, as a way that drug companies could be kept honest. They register their studies, their outcomes, their plan, and we can see if they keep their word. And it sounds like a great idea. At least this way, someone would know who’s doing what research out there, but what do we find? Drug companies don’t use it. Why should they? A new study last week in JAMA revealed that drug companies don’t register their studies half the time; that even when they do, they report only selective outcomes, not necessarily the ones they indicated in the database. We all know the equation: sponsorship + research = positive outcome, but why can’t the Journals, the physicians, the public, someone, anyone, do something about it? I like clinical research, I find it rewarding to have a clinical question and find an answer for it, with the hope that it may help some other physician or patient out there. With the comparative dearth of clinical research in older adults and palliative care being such a new relatively new field, I worry that the drug company influence in our lives may be even greater because there is less alternate competition. I don’t want to hurt my patients and when someone wants to hammer down my patient’s HgbA1c below 7, I cringe. Isn’t chasing the HgbA1C just another drug company ploy for my 80 year old patient? But how can anyone keep a clear head when we’re flooded with information that these are good things to do, that I'm a bad doc if I don't. I honestly have no solutions to this problem, only a nagging concern that fills me with worry and dread and keeps me up at night. Maybe I need some Lexapro? *This blog-post was sponsored and ghost-written and edited for content and posted by Geripal. They take a very interesting position that I don’t often see. I wonder whether the American public is ready for this. How different is dying in the UK? The Lancet article links to this blog, which is how I found you. What a wonderful blog! Thank you! Thanks Jan for the shout out about our recent Lancet publication. See our new post about written by Eric Widera. Chrissy, these are serious issues. 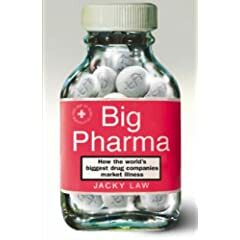 Big pharma has a role to play, and I do believe that some degree of private research and competition is important and beneficial. The question is similar to the questions being raised about the financial markets: how much regulation is optimal? I believe we need two fundamental changes to the way pharma is currently regulated: First, the incentives for profit need to be aligned to a greater extent with the best interests of patients. For example, greater incentives for vaccine development. Pharma currently has little interest in vaccine development simply because they have little potential for profit, especially compared to medications patients might use daily for life. Second, we need better safeguards in place to regulate pharma. Pfizer was fined $2.3 billion - sounds like a lot - until one considers that represents a mere 3 weeks of profit for the drug company. And this whole Bextra mess happened after Pfizer signed a statement promising to be good after the Neurontin scandal. Finally, these law suits are retroactive action, not pro-active. What is obvious from these issues is the need for tighter regulation at the level of trial registries, journal publication, and direct detailing to physicians. Finding the optimal balance of regulation is tricky -- too much and the "red tape" will hinder competition and innovation. Clearly, we're at "too little." The bottom line that's affected with two little regulation? Patients' pocketbooks, health, and even lives. One of the best lessons of geriatric training - apply guidelines with caution. It is even worse when someone pushes the A1c to < 7 while ignoring something much more important such as hearing, vision, or incontinence. The real challenge that arises from drug industry marketing has been its erosion of the firewall between commercial and scientific content. In particular, industry is involved in almost every facet of a doctor's professional life - from the sales representatives that we see in our offices, to industry sponsorship of the journal articles and CME programs that we use to keep current, to influence over local and national thought leaders who we turn to as models and teachers of best practices. Alex & Eric, Thanks for the blog!